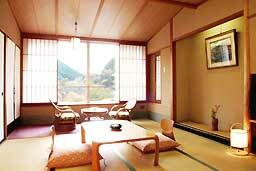 if necessary by using Japanese style rooms. Please enquire by telephone. For your added comfort, we have provided semi-double beds in our single rooms. In response to requests for two guests to stay on peak period days, we have provided a futon in each room. Relax in comfort in your room. Individual guests can enjoy the luxury of our hot spring at a reasonable cost. First time visitors are requested to pay a reservation fee during peak periods. The fee shown is per person per night, and includes breakfast. We regret that no children's price is available. Larger rooms are available for the use of families. be on duty after 10 p.m., but is unable to speak English. Breakfast can be taken from 7 a.m to 9 a.m.
Room charges are per person per night and include breakfast. *Guests reserving rooms during peak periods will be asked to provide a credit card number. There is a 1,500yen(tax excluded) discount for children aged 6 to 12. 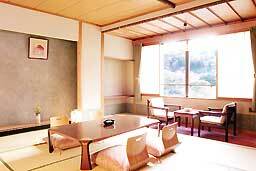 There is a fixed rate of 3,000yen(tax excluded) for children aged 3 to 5. There is a fixed rate of 1,000yen(tax excluded) for children aged 1 to 2. *Breakfast is a Japanese-style buffet. *Hand towels, toothbrushes, bath towels and robes are provided. free of charge at reception. *Hair driers, shampoo and soap are provided in the large bathroom. Hair driers can also be borrowed free of charge from reception. The following charges will be incurred in the event that a reservation is cancelled.